You can download all of your signed waivers to a CSV file. You can also download individual signed waivers as PDFs. 1. Click on the Export Data link from the sidebar and then click on the Export Participant Data link. 3. 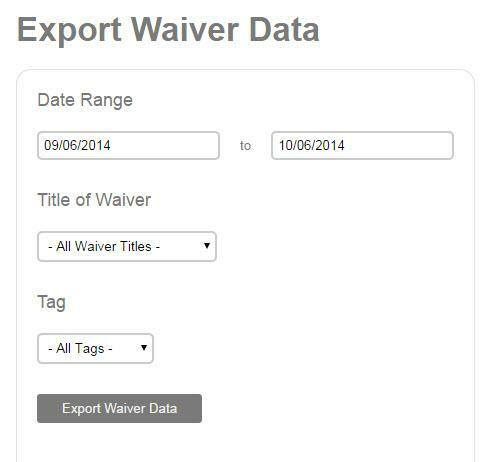 Click on the Export Waiver Data button and all information from your customers' signed waivers will be downloaded onto your computer as a CSV file. You can view your CSV file with the following spreadsheet software: Microsoft Excel, Apache OpenOffice (free) or Google Drive (free). After you download waiver data to a CSV file, you may want to remove duplicate email addresses in the Email field before importing the data into your email deployment system. Most email systems (e.g. MailChimp and Constant Contact) will automatically remove duplicates during the import process, however removing them prior to import may be helpful for those monitoring their contact count. How do I read a CSV file?